Born in Pennsylvania, but not raised in Pennsylvania. Anne is the daughter of a Naval officer. She and her family lived all over the world until her marriage brought her back to Pennsylvania and to Harrisburg where she raised her three children. She attended ten schools in twelve years! It could be said her education were her life experiences. She is a community leader and volunteer in Harrisburg and beyond having served on many boards including the Friends of the State Museum, as president. She is an active member of St. Stephen’s Episcopal Cathedral where she co-chairs the “Music by the River” series. Music is one of her major interests. 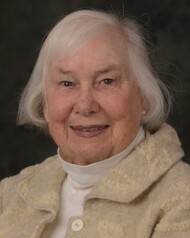 She volunteered for many years at WMSP-FM as an announcer/programmer of its classical music. She has also served on the board of The Bach Choir of Bethlehem, one of Pennsylvania’s historical and cultural treasures. She is known throughout the region for her flower arranging and design. She is an avid baseball fan, knitter and devoted great-grandmother. As a member of the Colonial Dames of America, she likes to think she honors her ancestors’ patriotism and public spirit by her own commitment to preservation and conservation. Currently, she serves as treasurer of the Pennsylvania Heritage Foundation.